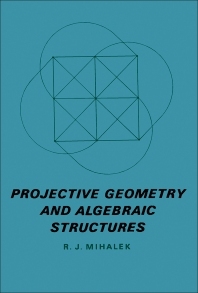 Projective Geometry and Algebraic Structures focuses on the relationship of geometry and algebra, including affine and projective planes, isomorphism, and system of real numbers. The book first elaborates on euclidean, projective, and affine planes, including axioms for a projective plane, algebraic incidence bases, and self-dual axioms. The text then ponders on affine and projective planes, theorems of Desargues and Pappus, and coordination. Topics include algebraic systems and incidence bases, coordinatization theorem, finite projective planes, coordinates, deletion subgeometries, imbedding theorem, and isomorphism. The publication examines projectivities, harmonic quadruples, real projective plane, and projective spaces. Discussions focus on subspaces and dimension, intervals and complements, dual spaces, axioms for a projective space, ordered fields, completeness and the real numbers, real projective plane, and harmonic quadruples. The manuscript is a dependable reference for students and researchers interested in projective planes, system of real numbers, isomorphism, and subspaces and dimensions.